Iron is a chemical element with symbol Fe (from Latin word Ferrum). Its atomic number is 26 and atomic mass is 55.85. It has a melting point of 1538 deg C and boiling point of 2862 deg C. The density of iron is 7.87 grams/cu cm. It is a metal in the first transition series. Like the elements of other group 8 elements (ruthenium and osmium), iron exists in a wide range of oxidation states, ?2 to +6, although +2 and +3 are the most common. Iron as a common metal is mostly confused with other metals such as different types of steels. Iron is by mass the most common element on the earth, forming much of earth’s outer and inner core. It is the fourth most common element and the second most common metal in the earth crust. Steels contain over 95 % Fe. Elemental iron occurs in meteoroids and other low oxygen environments, but is reactive to oxygen and water. Fresh iron surfaces appear lustrous silvery-gray, but oxidize in normal air to give hydrated iron oxides, commonly known as rust. Unlike the metals which form passivating oxide layers, iron oxides occupy more volume than the metal and thus flake off, exposing fresh surfaces for corrosion. Iron objects have been found in Egypt dating from around 3500 BCE (Before Common Era). They contain around 7.5 % nickel, which indicates that they were of meteoric origin. The ancient Hittites of Asia Minor (today’s Turkey) were the first to smelt iron from its ores around 1500 BCE. The ‘Iron Age’ had begun at that time. The first person to explain the various types of iron was René Antoine Ferchault de Réaumur who wrote a book on the subject in 1722. This explained how steel, wrought iron, and cast iron, were to be distinguished by the amount of charcoal (carbon) they contained. The industrial revolution which began during that century relied extensively on this metal. In iron, the basic building blocks are the individual atoms of Fe. The grains are called crystals and they are made up of atoms. All of the atoms are uniformly arranged in layers. If lines are drawn connecting the centres of the atoms, a three-dimensional array of little cubes stacked together to fill space is generated. At room temperature, the cubes have an atom at each of the eight corners and one atom right in the middle of the cube. This crystal structure is called a body-centered cubic (bcc) structure, and the geometric arrangement of atoms is often called a bcc lattice. The crystal lattice can be envisioned as three sets of intersecting planes of atoms, with each plane set parallel to one face of the cube. Iron with a bcc structure is called ferrite. Another name for ferrite is ‘alpha’ iron. Upon heating, iron experiences two changes in crystal structure. The first change occurs when the iron is heated to 912 deg C. At this temperature the crystal structure changes spontaneously from bcc to a new structure called face-centered cubic (fcc). In fcc structure, atoms lie on the corners of a cube as well as one atom at each of the six faces of the cube. Like the low temperature bcc structure, this structure is called either austenite or ‘gamma’ iron. If the heating of iron is continued beyond 912 deg C, then the second change in the crystal structure occurs at 1394 deg C when the austenitic grains of iron reverts back to body-centered cubic (bcc) structure known as ‘delta’ ferrite. On further heating pure iron melts at its melting temperature of 1538 deg C.
At 770 deg C known as the ‘Curie point’, iron becomes magnetic. As the iron passes through the Curie temperature there is no change in crystalline structure, but there is a change in the ‘domain structure’, where each domain contains iron atoms with a particular electronic spin. In non-magnetized iron, all the electronic spins of the atoms within one domain are in the same direction, however, the neighboring domains point in various other directions and thus overall they cancel each other out. As a result, the iron is non-magnetized. In magnetized iron, the electronic spins of all the domains are aligned, so that the magnetic effects of neighboring domains reinforce each other. When the structure of iron was being discovered in the late 19th century, the magnetic transition in iron occurring at 770 deg C caused scientists to theorize a structure of iron they called ‘beta’ iron, which was later shown not to exist. Although each domain contains billions of atoms, they are very small, about 10 microns across. At pressures above around 10 GPa (Giga Pascal) and temperatures of a few hundred kelvin or less, alpha iron changes into a hexagonal closed packed (hcp) structure, which is also known as ‘eta’ iron. The higher temperature gamma phase also changes into eta iron, but does so at higher pressure. Alpha iron is the most stable form of iron at normal temperatures. It is a fairly soft metal which can dissolve only a small concentration of carbon (no more than 0.021 % by mass at 912 deg C. Gamma iron is also soft and metallic but can dissolve considerably more carbon (as much as 2.04 % by mass at 1146 deg C). Iron as an element is not in common use. However, the term iron is used for different materials which contain a high percentage of iron in elemental form. These materials are categorized as (i) pure iron, (ii) wrought iron, (iii) cast iron, (iv) pig iron, and (v) direct reduced iron. 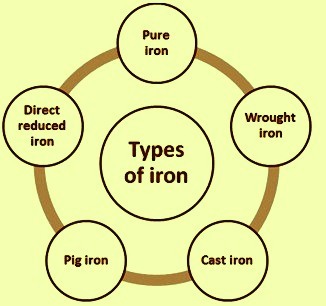 These types of iron are shown in Fig 1. Pure iron is a term used to describe new iron produced in an electric arc furnace where temperatures sufficient to melt the iron can be achieved. The result, also known as ‘butter iron’ is typically around 99.8 % pure with a carbon content of around 0.005 % and manganese content of around 0.005 %. There are also traceable amounts of a number of other elements some of which add certain properties or characteristics to the material and others which are of no significance. The typical analysis of the commercially produced pure iron is given in Tab 1. The ultimate tensile strength (UTS) of commercially produced pure iron is between 230 N/sq mm to 370 N/sq mm which is similar to that of new high grade wrought iron. There is little difference between the two materials other than the fact that pure iron does not contain any slag or laminations and has superior corrosion resistance. Pure iron is silvery white colored metal and is extremely lustrous. Its most important property is that it is very soft. It is easy to work and shape and is just soft enough to cut through (with quite a bit of difficulty) using a knife. Pure iron can be hammered into sheets and drawn into wires. It conducts heat and electricity and is very easy to magnetize. Its other properties include easy corrosion in the presence of moist air and high temperatures. Commercial pure iron has many different characteristics which include (i) improved resistance to corrosion and oxidation, (ii) excellent magnetic properties, (iii) high chemical and metallurgical purity, (iv) very good hot and cold forming capability, and (v) suitability for all types of welding. Wrought iron is a form of commercial iron which has very low carbon content (less than 0.10 %), less than 0.25 % of impurities consisting of sulphur, phosphorus, silicon and manganese. It is a semi-fused mass of iron with fibrous slag inclusions (up to 2 % by weight) which gives it a ‘grain’ resembling wood, which is visible when it is etched or bent to the point of failure. Historically, wrought iron was known as ‘commercially pure iron’. However, it no longer qualifies since current standards for commercially pure iron require a carbon content of less than 0.008 %. Wrought iron is soft, ductile, magnetic, strong with high elasticity and tensile strength, malleable and hence it can be heated and reheated and worked into various shapes, becomes stronger the more it is worked, and suitable for members in tension or compression. It is corrosion-resistant and can be welded. Before the development of effective methods of steelmaking and the availability of large quantities of steel, wrought iron was the most common form of malleable iron. A wrought product is one that has been mechanically worked by forging, extruding, rolling, and hammering etc., to change its form and properties. Wrought iron product is a particular worked iron product which is rarely produced now since other cheaper, superior products have substituted it. Wrought iron is redshort if it contains sulphur in excess quantity. It has sufficient tenacity when cold, but cracks when bent or finished at a red heat. Wrought iron with high sulphur is therefore useless for welding or forging. The slag inclusions, or stringers, in wrought iron give it properties not found in other forms of ferrous metal. There are around 400 inclusions per square millimeter. A fresh fracture shows a clear bluish colour with a high silky luster and fibrous appearance. Wrought iron lacks the carbon content necessary for hardening through heat treatment. Wrought iron may be welded in the same manner as mild steel, but the presence of oxide or inclusions gives defective results. The chemical composition of wrought iron appears to the plain carbon steel, but most of the manganese, sulphur, phosphorus, and silicon are incorporated into the slag fibers present in the wrought iron. The properties of cast iron can be varied widely by varying the percentages of carbon and silicon, by alloying with various metallic elements, and by varying the practices of melting, casting, and heat treatment. The metallurgy of cast irons has many similarities to that of steel, but the differences are important to the metallurgist who works with cast irons. The main factors which have influence on the micro structure of the cast iron are (i) chemical composition, (ii) cooling rate, (iii) liquid treatment, and (iv) heat treatment. White cast iron – It is the result of metastable solidification (Fe3C eutectic). White cast iron is named such since this iron is having characteristic white crystalline fracture surface. The fracture in white cast iron occurs along the iron carbide plates. This cast iron is formed when the carbon in solution in the liquid iron does not form graphite on solidification but remains combined with the iron, often in the form of massive carbides. White cast iron is hard and brittle. It has high compressive strength (more than 1380 N/sq mm) and good retention of strength and hardness at higher temperature. It is very often used for its excellent resistance to wear and abrasion. Applications of white cast irons include brake shoes, shot blasting nozzles, mill liners, crushers, pump impellers and other abrasion resistant parts. Gray cast iron – It shows a gray fracture surface consisting of ferrite and dispersed graphite flakes. The fracture surface appears gray because of the predominance of exposed graphite. When the composition of the iron and the cooling rate at solidification are suitable, a substantial portion of the carbon content separates out of the liquid to form flakes of graphite. The fracture path of such iron follows the graphite flakes. Gray cast iron is the result of stable solidification produced at slow cooling. It has several unique properties which are derived from the existence of flake graphite in the microstructure. It possesses high compressing strength, fatigue resistance and wear resistance. It is relatively soft and can be machined and welded easily. It has hardness conducive to good wear resistance. It resists galling under boundary-lubrication conditions. It has very good properties for use in vibration damping or moderate thermal shock applications. It is used for engine cylinder blocks, gears, flywheels, water pipes, brake discs, and machine tool structures etc. Presently the common classification scheme divides cast irons into four basic types. These are (i) white cast iron, (ii) gray cast iron, (iii) ductile cast iron, and (iv) malleable cast iron. The ductile cast iron and malleable cast iron are described below. Ductile cast iron – It is so-called since in the as-cast form, it shows measurable ductility. By contrast, neither white nor gray iron shows significant ductility in a standard tensile test. It is also known as nodular iron or spheroidal graphite cast iron. It is similar to gray iron in composition but during its casting, the graphite is caused to nucleate as spherical particles instead of flakes. This is achieved through the addition of a very small but definite amount of magnesium and/or cerium to the liquid iron through a process step called nodulizing. The ductile cast iron consists of nodular graphite particles in ferrite or pearlite matrix. It is produced from the same raw materials as gray iron, but these materials are to be low in sulphur. Casting properties of ductile cast iron such as fluidity etc. are similar to those of gray cast iron. Main advantage of ductile cast iron is its combination of high strength with ductility. Ductile cast iron also possesses good fatigue strength, wear resistance, shock resistance, and high modulus of elasticity. Martensitic ductile cast iron and austempered ductile cast iron show even better properties. Applications of this cast iron include automotive engine crankshafts, heavy duty gears, military vehicles, and railway wagons. Malleable cast iron – It is cast as white cast iron, then ‘malleabilized’ (i.e., heat treated to impart ductility to the brittle material). The micro structure consists of ferrite and particles of free graphite. This cast iron encompasses a form of graphite called temper carbon. This form of graphite is produced by the heat treatment of white cast iron. When a white cast iron is heated for an extended period of time (about 60 hours) at a temperature of 960 deg C, the cementite decomposes into austenite and graphite. By slow cooling from 960 deg C, the austenite transforms into ferrite or pearlite depending on the cooling rate and the diffusion rate of carbon. The ductility and toughness of malleable cast iron falls between that of ductile cast iron and gray cast iron. Now a days malleable cast iron has been replaced by the more economically produced ductile cast iron for many uses. Malleable cast iron besides ductility has good machinability. Ferritic malleable cast iron is more ductile and less strong and hard, than pearlitic malleable cast iron. Applications of malleable cast iron include parts of power train of vehicles, bearing caps, steering gear housings, agricultural equipment, and railroad equipment. High-alloy graphitic iron – It is used primarily for applications requiring corrosion resistance or a combination of strength and oxidation resistance. It is produced in both in flake graphite form (gray cast iron), or in spheroidal graphite form (ductile cast iron). Lastly, a classification used frequently by the foundry worker divides cast irons into two categories. These are (i) common cast irons which are used for general-purpose applications mainly unalloyed or low alloy cast irons, and (ii) special cast irons which are used for special applications and are generally high alloy cast irons. Special cast irons differ from common cast irons mainly in the higher content of alloying elements (more than 3 %), which promote microstructures having special properties for elevated- temperature applications, corrosion resistance, and wear resistance. The term ‘pig iron’ has arisen from the old method of casting liquid iron from a blast furnace into moulds arranged in sand beds. The traditional shape of the moulds used for these ingots was a branching structure formed in sand. It had many individual ingots at right angles to a central channel or runner. Such a configuration is similar in appearance to a litter of piglets suckling on a sow. Name of these ingots was given from the word “piglets”. When the metal had cooled and hardened, the smaller ingots (the pigs) were simply broken from the much thinner runner (the sow). Since pig iron was intended for remelting, the uneven size of the ingots and inclusion of small amounts of sand were insignificant when compared with its ease of casting and of handling. Presently most of the hot metal is produced and consumed within integrated steel plants for steel making. In this context the term ‘pig iron’ is something of a misnomer within integrated steel plants since hot metal is transferred directly to the steel melting shop in liquid form. The liquid iron which is not sent for steel making is cast into pigs in pig casting machine for use in steel making later as cold charge or is sold to foundries or to mini steel plants having induction furnaces as merchant pig iron. Modern pig casting machines produce pigs having individual weight ranging from 15 kg to 45 kg. Merchant pig iron is the cold iron which falls into the category of ferrous metallics. There are some dedicated merchant plants whose entire production is sold to external customers. Pig iron is an iron-carbon alloy in which besides carbon other elements are silicon, manganese, sulphur, phosphorus and other elements such as titanium etc. All forms of pig iron contain around 3.5 % to 4.5 % carbon with sulphur content less than 0.05 % and phosphorus content can be up to 0.12 %. Merchant pig iron is basically of the following two types. Basic grade – Basic pig iron has less than 1.0 % silicon, under 1 % manganese, and trace amounts of sulphur and phosphorous. This type of pig iron is mainly used for steel making. There are several grades specified in various standards based on silicon and manganese content of the pig iron. Foundry grade – This type of pig iron is being used in iron foundries and contains higher silicon. Various standards specify composition limits for silicon and manganese for different grades of this type of pig iron. Silicon content in foundry grade pig iron is much higher and usually is in the range of 1.5 % to 3.5 %. It can be as high as 4.25 %. Pig iron is hard, wear resistant, fairly fusible and very brittle. It is not useful directly as a material except for limited applications. It has a low melting point (around 1200 deg C) as compared to steel. Typically its hardness varies between 250 to 450 BHN. The lower melting point of pig iron combined with higher density of the charge due to it, results into lower energy requirements and faster melting time during steelmaking when compared to that of an all steel charge make-up. Some pig iron grades are suitable for producing ductile iron. These are high purity pig irons and depending on the grade of ductile iron being produced these pig irons may be low in the elements silicon, manganese, sulphur and phosphorus. These types of pig irons are useful to dilute all elements in a ductile iron charge (except carbon) which may be harmful to the ductile iron process. Direct reduced iron (DRI) is produced by the reduction of iron ore (in the form of lumps or pellets) by either non-coking coal or a reducing gas produced by reforming of natural gas. The reducing gas can also be produced by the gasification of coal. The reduction process is conducted at high temperature but substantially below the melting point of iron. Since the reduction reaction takes place in solid state, the lump or pellet retain their original shape, but are considerably lighter due to the removal of the oxygen from the ore. Hence the produced direct reduced iron has a highly porous structure. This porous structure gives DRI an appearance of a sponge and because of it, DRI is also known as sponge iron. As DRI is made by reducing gases, it has a porous, sponge like form. Consequently, it has a large surface area relative to its mass, which enhances its reactivity. If it becomes wet, it oxidizes and liberates hydrogen gas from the water. This particularly is true if the water contains dissolved salts such as sodium chloride (e.g. sea water). As part of the reaction, it heats up significantly, which further stimulates the oxidation of the still dry lumps or pellets, resulting in chain reaction that spreads rapidly throughout the DRI pile. When sufficient oxygen is available, temperature can reach as high as 1500 deg C. If stored in a closed environment, such as a ship’s hold, the hydrogen liberated crates a potentially explosive mixture. Further, ventilation to remove the hydrogen enhances the oxidation, and thus the overheating. The second method of retarding the oxidation rate is to coat the DRI with a chemical (e.g. sodium silicate – water glass) which protects it from the air. This has proven effective against overheating in case of contact with fresh water but is not effective against sea water. The third and most effective means of slowing oxidation is by addressing directly the source of the problem i.e. by lowering the surface area of the DRI and increasing its thermal conductivity. This is carried out by compaction of the DRI as soon as it is produced at temperatures at or above 650 deg C, into briquettes of minimum density of 5.0 grams/cu cm, so as to close most of the pores in the material. The product is known as HBI. HBI is a relatively safe form of DRI which is suitable for bulk shipment and outdoor storage. The average particle size of DRI in case of lumps and pellets is 4 mm to 20 mm while that in case of fines is up to 4 mm. Typical size of CBI is 16-24 mm x 20-30 mm x 40 – 50 mm while typical size of HBI is 30 mm x 50 mm x 110 mm. HBI has got a pillow like shape. The analyses and the specifications of different types of DRI are given in Tab 2. Iron content in the DRI is in two forms. One is in metallic form which is known as metallic iron, Fe M, and the second form is iron present in residual iron oxides. The total iron Fe T in DRI is the sum of these two iron components. Metallic iron is the aggregate quantity of iron, either free or combined with carbon (as cementite) present in DRI. Metallization of DRI is a measure of the conversion of iron oxides into metallic iron (either free or in combination with carbon as cementite) by removal of oxygen due to the action of the reductant used. Degree of metallization of DRI is the extent of conversion of iron oxide into metallic iron during reduction. It is defined in percentage of the mass of metallic iron divided by the mass of total iron. The terms associated with the DRI are defined as follows. Percent total iron ‘Fe T’ is the total iron in a sample, including metallic iron and iron chemically combined with other elements such as oxygen. Percent metallic iron ‘Fe M’ is iron chemically uncombined and as cementite (Fe3C). Residual iron oxides are remaining oxides of iron present in the DRI either in the form of FeO, Fe3O4 or Fe2O3, though normally FeO is usually the only residual oxides present. Total carbon is the total carbon present in the DRI and is equal to the sum of free and combined carbon (as cementite). Impurities are undesirable elements/compounds in the DRI, sulphur and phosphorus being the most common among them. Metallization is a measure of the conversion of iron oxides into metallic iron (either free, or in combination with carbon as cementite) by removal of oxygen due to the action of the reductant used. Degree of metallization refers to that portion of the total iron present as metallic iron. Equivalent metallization – Carbon content in sponge iron at a given degree of metallization is important. It has the capacity to remove oxygen from the remaining iron oxides during steel making. This leads to the concept of equivalent metallization, which is defined as follows. Percent reduction refers to the oxygen which has been removed in producing the DRI with reference to initial Fe as Fe2O3. This definition gives the state of the iron contained in the DRI. Confusion can arise as some people define percent reduction in reference to the initial oxide state of the ore which may include Fe3O4 and FeO. In that case, percent reduction defines the amount of reduction performed in the DRI process. Percent gangue refers to the non-iron compounds (SiO2, Al2O3, CaO, MgO, etc.) in the DRI. Quarternary basicity is the ratio of CaO, MgO, and Al2O3, SiO2, and is expressed as the ratio of (% CaO + % MgO)/(% Al2O3 + % SiO2).